The global drone market will grow from $14 billion in 2018 to over $43 billion in 2024 at a CAGR of 20.5%. Service is and will continue to be the largest segment of the drone industry, but software is the fastest growing. Energy is and will continue to be the largest industry on the drone market, but Transportation & Warehousing is going to close the gap and overtake all others as the fastest growing industry. Inspection continues to be the leading application method of drones, but the greatest growth is expected in drone deliveries. The North American market is currently the largest regional drone market, but the Asian one is growing at a much higher rate and expected to take over by the end of this year. Having legalized drones in December 2018, India will be by far the fastest growing commercial drone market in the world, by 2024 becoming the 3rd largest commercial drone market. Our new Drone Readiness Index (DRI) provides a comparative overview of drone regulations across the globe, followed by a deep dive into 20 national legislations. This DRONEII report provides the most comprehensive outline, analysis and forecast of the drone market. It is based on months of research and analysis by our team and the DRONEII market model which was built based on years of experience in the commercial drone industry and an intimate understanding of the drone market. The DRONEII Market Model is a unique bottom-up approach to measuring the commercial drone market using actual data and primary sources. As a result of this complex model, the figures and topics covered in this report are both comprehensive and reliable. They are a product of both qualitative and quantitative research and analysis, and a look beyond the hype that drones have experienced in the past few years. 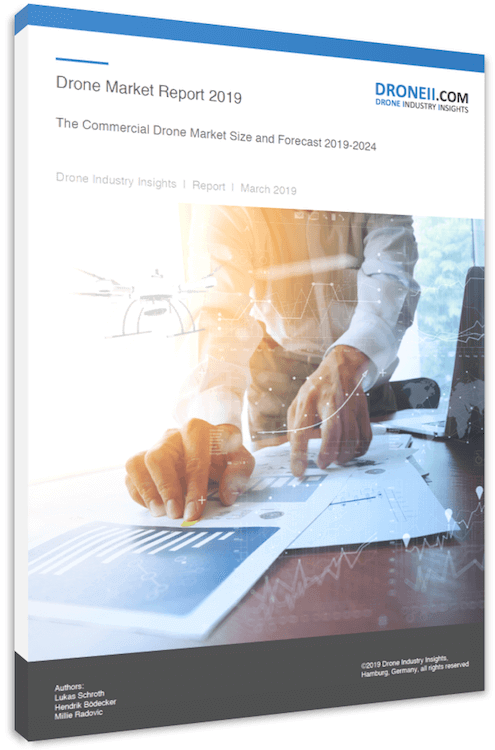 The 265-page report contains a five-year forecast of global drone market figures for 2019-2024, broken down by segment, industry, application method, region, and country. It also contains a comparative analysis of global drone regulations – our new Drone Readiness Index – as well as a deep dive into twenty different national regulations. Finally, this report also discusses the future trends and opportunities to look out for on the drone market. 2.1 Drones: Where Do They Come From? 2.3 Drones: What Do They Do?